This 2.5-liter four-cylinder gasoline engine is an updated version of the 2.3-liter L3-VE engine belonging to the Mazda’s L-series. The driver was introduced in 2008 for Mazda6 (Atenza). A year later, it was available on the US market also (2009-2013 Mazda 6). Like a smaller 2.3l engine, the L5-VE has an aluminum alloy cylinder block with sleeves/liners cast directly into the engine block. But the cylinder liners are made of 4340 steel-molybdenum alloys instead of cast iron. This material has less friction and high-heat resistance. The engine block was stroked up to 100 mm (3.94 in) and bored up to 89 mm (3.50 in). As a result, the engine displacement is 2,488 cc or 2.5 liters. The L5-VE has a forged steel crankshaft with eight counterweights (like a 2.3L DISI Turbo or L3-VDT). There is a flexible joint between the crankshaft and the flywheel for resonances reduction at the middle and high revs (2,000-5,000 rpm) of the engine. The L5 engine has a cassette type balancer unit as well. It has two balance shafts driven through a gear directly by the crankshaft. Bottom end also received forged powder-metal connecting rods and new aluminum pistons with graphite-coated skirts. The engine has an aluminum alloy cylinder head with four valves per cylinder. On top of the head, there are two overhead camshafts driven by a maintenance-free timing chain equipped with an automatic chain tensioner. The valvetrain has shimless, mechanical bucket tappets (no hydraulic tappets). Intake valve lift is 9.1 mm; exhaust valve lift is 7.8 mm. The 2.5-liter engine is equipped with variable valve timing system for the intake valves only (Mazda’s Sequential Valve Timing or S-VT system). 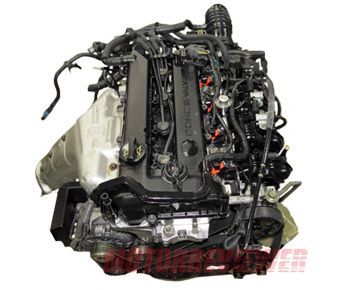 Like the L3-VE, the MZR 2.5 has a plastic variable length intake manifold. The system name is the Variable Induction System or VIS. The VIS provides long ports layout for low revs and short for high engine revs. Those manipulations increase the pulsing effect of the airflow and draw more air into the cylinder for better efficiency and performance. The L5-VE engine has an electronically controlled sequential, multi-point fuel injection and ignition system with individual direct ignition coils. The exhaust gases go through a stainless steel exhaust manifold/header with a heat-insulating layer and the catalytic converter. The L5-VE engine doesn’t have typical problems at all. The only thing is that the 2.5l engine is a little bit noisy, and at low rpm, there is not enough torque to move a big SUV or a midsize sedan (Mazda6 for example). For a fast acceleration, you have to push the gas which negatively affected the city gas mileage. Mazda’s 2.5-liter engines of the L-series are very reliable, durable and trouble free engines. With proper maintenance, you can easily get 300,000 miles on it.